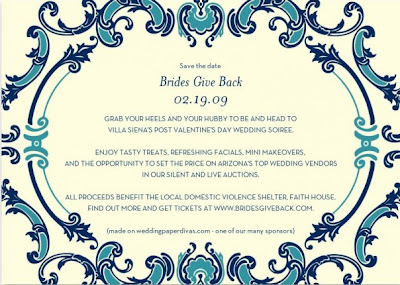 I wanted to post an invitation to you all to come to the upcoming Brides Give Back event that is being held by a friend of mine, Sarah Ralston and her trusty committee. With times of hardship on the rise, domestic violence is even more prevalent. It’s a disastrous cycle that we are all effected by and we as a community need to unite to support the women, children, and men in crisis. Please spread the word to your clients and supporters by email, word of mouth, print, blogging, etc. This event will raise not only needed funds but a better awareness for education and how to break this ruthless succession. Below you will see an e-vite to the event. Please attend, support and spread the word. It will be a blast and will include fantastic auction items, treats and beverages, including a package for 6 hours of wedding videography from My Wedding Film! Tell brides that there will even be items that she can utilize on her wedding day. "Give a little ...and get a lot for your big day."